The UK-French company Vigeo Eiris advising investors on the occupations of Palestine and Crimea is facilitating the Moroccan government’s energy projects in occupied Western Sahara. The ethical investor community is baffled. Read all here. Western Sahara Resource Watch (WSRW) has since its establishment 13 years ago built a close contact with investors and ethical analysts internationally. Over the course of the last few months, investors and analysts are increasingly surprised to see not only how Vigeo Eiris is working with Moroccan affairs in Western Sahara, but most importantly how it also how it justifies this. Here is the whole issue. Vigeo Eiris is a company providing advice to investors and pension funds in Europe on matters of responsible investments. The company is also large on evaluations, certifications and ratings. The company is a 2015 merger between the two agencies Vigeo and Eiris, from France and the UK, respectively. The two were of very different structure and traditions at a time of merger, covering different markets. From a business perspective, the merger made sense. At that point, Eiris was running a separate project “Business on occupied lands” – investigating companies operating in occupied Palestine and Crimea, while Vigeo was large on the Moroccan market. The dilemma today is that the Eiris team sits with experience on how investors should avoid placing money in Palestine and Crimea, while the Vigeo team is helping Morocco in investments in occupied Western Sahara. Vigeo Eiris is strong on certifications. On 3 November 2016, the Moroccan Agency for Sustainable Energy (MASEN) announced that Vigeo Eiris had certified so-called green bonds for three projects they have in the pipeline. One of the projects in question are in Morocco, two of them in Western Sahara. With the bonds, the Saudi company ACWA could carry out energy projects. 100 MW of the total 170 MW will be built in Western Sahara. Morocco has selected Saudi company ACWA Power to develop 100 MW of solar power in occupied Western Sahara. The deal was inked at the UN's Climate Conference, COP22. Why are such projects wrong? -In a judgement on the 21 December 2016, the Court of Justice of the EU confirmed that the territory of Western Sahara is distinct and separate from Morocco, and that the Saharawi people’s right to self-determination mean that one has to seek the consent from the people of the territory. -The people of Western Sahara has not consented. -Through the energy projects which Morocco are currently building in Western Sahara, Morocco is cementing its illegal occupation of the territory. By 2020, Morocco plans to produce more than a quarter of its renewable energy outside of its international borders, in Western Sahara. -31 January 2017, the EU Commissioner for Climate Action and Energy confirmed that due to the separate and distinct status of Western Sahara, energy produced in Western Sahara cannot be imported into Europe. Investors such as the European Investment Bank, the European Commission and the German Development Bank have refused to fund allegedly “green” projects in the energy sector in Western Sahara. Certification company DNV GL has refused to give such certification due to its location. -A group of Saharawis who wanted to attend a hearing by ACWA in El Aaiun, Western Sahara, on 30 November 2016, were kicked out by the authorities. "I wonder who they are consulting, if we - the Saharawis - are not allowed in the room", one of the expelled stated, touching upon the very core of the problem. ACWA has not responded to letters from WSRW on 2 February 2013 and 29 November 2016. -WSRW on 16 November condemned the Moroccan-Saudi energy project. -Its role during the certification was limited to assess the projects’ impact on climate change, energy efficiency and their impact on sustainability, not the topics raised by WSRW. -A refusal to give certifications to bonds relating to Moroccan projects in Western Sahara would be an act of politics which it cannot do due to its role as independent research provider. -Such projects can “improve the populations’ living conditions, within or outside the internationally recognised borders of Morocco”. -Morocco has no right to be present in Western Sahara. It is illegal for Morocco or any other state or company to carry out projects in Western Sahara without first seeking the consent of the people of the territory. The matter of the illegality was established by the Court of Justice of the EU on 21 December 2016. In this context, facilitating the financing of such illegal projects are unethical. -The people of Western Sahara do not wish to welcome Moroccan energy projects in Western Sahara. The fact that a project may be to the benefit of the global climate is in this regard irrelevant. -Vigeo Eiris' arguments of improvement of local living conditions has not been discussed with the representative of the people of the territory, and aim primarily to support settlers and occupiers. -Vigeo Eiris supports its position by making strong political positions in Morocco's favour. Vigeo Eiris fails to apply the same terminology to the territory as the one used by the United Nations. In letter of 27 January, Vigeo Eiris labels “Western Sahara” as “the region of Sahara”. This reflects the Moroccan narrative. Morocco’s suggestion to include Western Sahara into the Moroccan kingdom, presented to the UN Secretary General in 2007, is officially called “Proposal for the Negotiation of a Statute of Autonomy for the region of Sahara”. 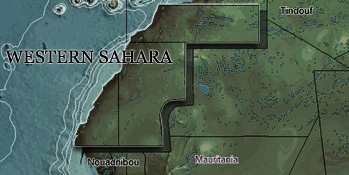 In letter of 27 February, Vigeo Eiris uses the formulation “the western side of Sahara” - twice. The maps on the website of Vigeo Eiris are wrong. The United Nations, the International Court of Justice, the Court of Justice of the EU, and no state of the world recognize the Moroccan sovereignty claims to the territory. This is how the UN sees Africa. The Vigeo Eiris map to the right is found on its website. Vigeo Eiris claims that the “administrative status is the subject of a long-standing dispute between Morocco and Polisario”. It is not the administrative status which is under dispute. The administrative status has been clearly established by the UN: Morocco is not the administrative power of the territory. The question of the UN, and the purpose of the UN talks, is how to achieve the realisation of self-determination for the people of Western Sahara. The territory is treated by the UN General Assembly as one of decolonisation. Vigeo Eiris states that the term is “not endorsed by the whole international community”. It should be noted that not a single territory or country in the entire world would be qualified as “occupied” if applying this criterion. Western Sahara has been labelled as under occupation by the UN General Assembly. The United Nations Mission for the Referendum in Western Sahara was sent to the territory in 1991. The right to self-determination is the core of the UN peace talks. Vigeo Eiris refers to this right twice: “Polisario asks for a referendum for self-determination” (letter of 19 Dec 2016) and “we acknowledge that the principle of self-determination is one of a number of factors referred to in the relevant international texts” (letter of 27 Feb 2017). Vigeo Eiris replaces the term “people” with the one of “population”. For instance, “these investments can drive the improvement of populations’ living conditions” in all letters. The Court of Justice of the EU judgement of 21 December 2016, and Article 1 of the ICESCR and ICCPR Covenants are clear on these points. It is a “people” – not a “population” – which has the right to self-determination. Any UN Security Council resolution on Western Sahara would identify the national liberation movement of Western Sahara, Polisario Front. as one of the two “parties” to the conflict. This is also clear from the CJEU judgement of 21 December 2016. Vigeo Eiris labels Polisario as a “stakeholder”. The CJEU and the ICJ are clear that Moroccan sovereignty does not apply in Western Sahara. Vigeo Eiris seems to have taken a stand on MASEN has a mandate or a legitimate opinion in improving the socio-economic conditions in Western Sahara. 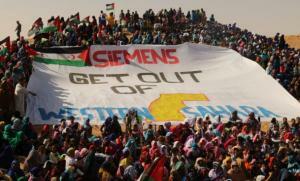 Hundreds of Saharawis gathered to protest Siemens, which is developing the energy infrastructure in Western Sahara for the Moroccan government. 1) Is ethically problematic and shows that Vigeo Eiris has little understanding of the situation on the ground in Western Sahara, arguing that people are to jeopardise their own personal safety to protest. 2) Is factually wrong, as several demonstrations have taken place. 3) Shows that Vigeo Eiris is relating to human rights abuses in a reactive, rather than proactive manner not acting in line with today’s understanding of a company’s human rights obligations and contrary to the principles and guidelines of for instance UNGP or OECD which Vigeo Eiris states that it respects. 4) Proves WSRW’s point. The fact that Vigeo Eiris has “not collected (…) material element suggesting the opposition” against energy projects raises the immediate question: Why did Vigeo Eiris not seek to collect such information? Vigeo Eiris states that it cannot refuse to certify Moroccan projects in Western Sahara since it wants to maintain an "independent" role. Vigeo Eiris has not yet answered to questions whether it is certifying Russian or Israeli projects in Crimea and Palestine, so it is not possible to say if they also use arguments of "independence" to explain certification of projects in similar situations of illegal occupation. Numerous investors internationally have refused to invest in Western Sahara exactly because they do not want to take sides, stating it does not want to engage in politics. Eiris Foundation has for years been running a project to guide investors who want to avoid investing in Palestine and Crimea. -Fails on due diligence. Vigeo Eiris states, as WSRW understands Vigeo Eiris’s letter on 27 February, that it has not undertaken a due diligence on the matters which is of WSRW’s concern - e.g. on international law, the status of Western Sahara and human rights - prior to the decision of undertaking a certification of Moroccan energy projects in Western Sahara. -Fails addressing its own responsibility. Vigeo Eiris states that its primary responsibility is “to provide material and independent information to investors and corporates, taking into account the legitimate interests of all stakeholders without exception, to underpin their judgements, rather than to decide on what projects should be financed and what should not”. By doing so, Vigeo Eiris fails its obligation to verify that its own activities are respecting its human rights obligations. This constitutes a basic element of the UN Guiding Principles. -Does not answer questions from civil society. Based on Vigeo Eiris’ silence, WSRW proceeded on 3 March 2017 to request intervention from UN Global Compact (in which Vigeo Eiris is a participant) to assist in achieving replies. It is a basic criterion for a company that adheres to UNGC to reply to questions from civil society. See the unanswered questions below. -Misrepresents critique. In its correspondence, Vigeo Eiris misrepresents the essence of WSRW's concerns, stating for instance that WSRW is against all certified renewable energy projects. -WSRW to Vigeo Eiris on 18 November 2016, requesting confirmation about the news. -Vigeo Eiris to WSRW on 19 December 2016, confirming the news, and arguing that the operation is known and ok.
-WSRW to Vigeo Eiris on 23 December 2016, with questions regarding the operation, and objecting to it. -Vigeo Eiris to BHRRC on 27 January 2017, stressing its role in only verifying the projects' compliance with Climate Bonds Initiative (CBI) standards. -WSRW to Vigeo Eiris on 14 February 2017, requesting an answer to the questions. -Vigeo Eiris to BHRRC on 27 February 2017, further explaining that its projects are ok, stating that the letter it had sent to BHRRC on 27 January was also meant for WSRW, and that it will neither withdraw the certification nor answer the questions from WSRW. -WSRW to Vigeo Eiris on 3 March 2017, requesting answer to the questions. WSRW letter to CBI, on 19 January 2017 and 14 February 2017, questions have not been responded to. WSRW questioned Vigeo Eiris regarding its decision to certify projects in Western Sahara on 23 December. No letter from Vigeo Eiris has been addressed to WSRW since. Two letters were sent from Vigeo Eiris to BHRRC over the matter. While a few of the topics were touched upon in those letters, the questions from WSRW have still not been answered. In the below overview, WSRW assesses which questions could be interpreted as answered to - and which were not. 1. Was the contract with MASEN for the certifications of bonds relating to projects in Western Sahara the same contract as the one relating to the projects in Morocco? 2. How much was Vigeo Eiris paid by MASEN for carrying out this certification? 3. What were the terms of reference of the contract with MASEN? 1. Has Vigeo Eiris been in contact with representatives of the people of Western Sahara prior to or during the certification process, to seek permission to carry out such certification? 2. Regarding the maps on Vigeo Eiris’ website: Does Vigeo Eiris agree that Western Sahara is not part of Morocco, but a separate territory, under process of decolonisation? 3. Does Vigeo Eiris agree with the Court of Justice of the EU that the Polisario Front has to be consenting for activities to be legal? 4. Is it of Vigeo Eiris’ opinion that Article 1 of the International Covenant on Economic, Social and Cultural Rights and International Covenant on Civil and Political Rights establishes peoples’s right to self-determination? 5. Vigeo Eiris stated that its task is to “deliver assessments in line with” a number of principles on guidelines” (e.g. OECD, ISO 26000, CBI, UNGP), “which provide processes to ensure that conventions are respected”. It should be noted that commentary to UNGP Principle 12 underlines the respect for the ICESCR and the ICCPR. How does Vigeo Eiris’s contract with MASEN respect the principle of self-determination in the Article 1 of those two covenants? 6. In the 19 December 2016 letter to WSRW, Vigeo Eiris had stated that “we question and evaluate all companies under review” on matters of human rights. The ICESCR and ICCPR UNHRC committees in 2015 and 2016 in their evaluations of Morocco’s obligations under the two covenants found that consent had not been sought by Morocco in its dealings in the territory. The Saudi company ACWA, which won the tenders in El Aaiun and Boujdour that Vigeo Eiris certified, has not responded to question from WSRW whether they sought the consent of the people of Western Sahara. Has Vigeo Eiris tried to determine whether MASEN or ACWA have respected Article 1 of these covenants prior to its undertaking of this assessment? 7. Based on the previous question, how does this analysis (or lack of analysis) by Vigeo Eiris on whether or not a consent had been sought correspond with Vigeo Eiris’ claim to support human rights and evaluating companies’ human rights performance, in line with UNGP? 8. Does Vigeo Eiris have a policy on whether it can certify projects on illegally occupied territories? 9. Does Vigeo Eiris have a policy on whether it can certify companies with operations on illegally occupied territories? 10. Does this (as mentioned in 8 and 9 above) apply also to the subsidiary Vigeo Eiris Maroc? 11. We note that Eiris Foundation has worked on advising investors on Palestine and Crimea, but not yet Western Sahara. We understand from www.vigeo-eiris.com that Vigeo Eiris has an office and a large presence in Morocco. Is that a risk that the company's presence in Morocco limit the credibility of Vigeo Eiris and the Foundation to provide proper ethical advice on occupied territories in general, and on Western Sahara in particular? 12. Has Vigeo Eiris to this date given certifications to any kind of projects, including to green bonds, to programmes run by the Israeli or Russian government in occupied Crimea and Palestine? 13. Will Vigeo Eiris rectify the maps on its website, so that they are in line with international law? 14. On its Ranking Emerging 70, Vigeo Eiris includes companies such as Lafarge Ciments and BMCE Bank. http://www.vigeo-eiris.com/wp-content/uploads/2016/10/Finale_Ranking_template_EM70_072016.pdf The former is planning to operate in Western Sahara, while the latter is one of two Moroccan banks securing credit to the controversial green energy programmes in Western Sahara after European investors have refused to allocate such money due to responsibility policies (read about that in our report ‘Powering the Plunder’ in www.wsrw.org). We would like to underline that these two Moroccan companies are controversial, and that they deserve to be filtered out of ranking of that reason. If this notification is not sufficient, we would appreciate a clarification as to what further information would be needed to have them removed from this ranking, and what mechanism we should proceed with to file this request as a controversy sufficient enough for exclusion from that list. (On another, general note, we are baffled to see so many controversial companies on that particular ranking, the most prominent being Cemex in occupied Palestine and Ecopetrol in Colombian rainforest, we recommend a review of the methodology of that ranking). 15. We have noted that the company writes “Our primary responsibility is to provide material and independent information to investors and corporates”. On this basis, WSRW would like Vigeo Eiris to forward to us the material and information which was sent to investor and corporates regarding the bonds and projects in Western Sahara.